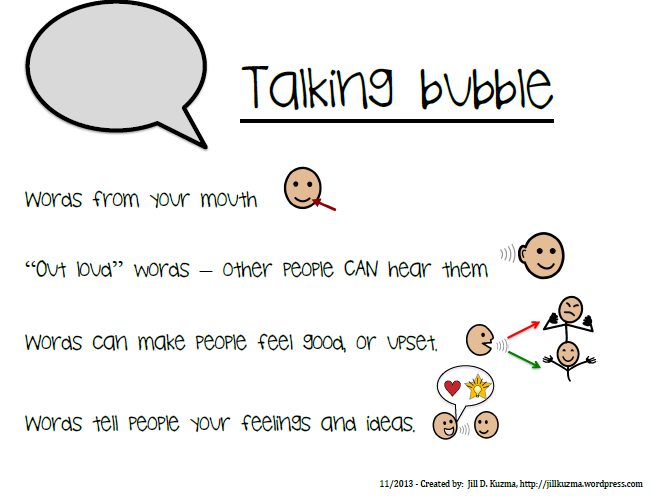 Tell the child that you are going to “pop their thinking bubble so the words will fall out” and the child can now, “make a talking bubble” to tell the friends what their favorite treat is. 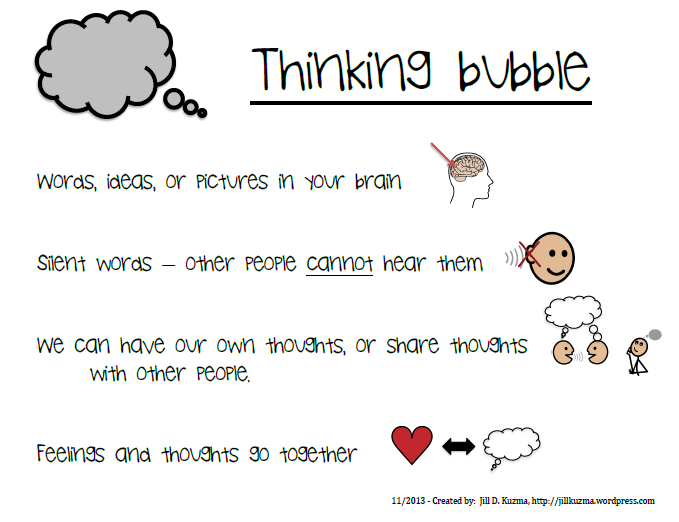 Make a tapping sound on the thinking bubble picture – (or I pretend to pop the bubble with one of those hand/finger pointers that teachers use), remove the taped picture from the backside of the thinking bubble and tape it to a talking bubble (found here if you need it: Talking Bubble Print Here.) Hold the talking bubble by the child’s mouth and instruct them to say the word of their favorite treat. Review the descriptor of a “Talking Bubble”, provided above. If some children choose the same treat, point out that they were “sharing a thinking bubble” with each other. When they were making a picture of their favorite treat – they were sharing a thinking bubble by having the same idea of their favorite dessert. The BIG TAKE AWAY IDEA is to explain to the students that people usually do not know what is in another person’s thinking bubble. But, if we “make a talking bubble” (a.k.a. use our words), other people can find out what you want, and learn about your ideas. These are important cues and concepts to reinforce with kids in this activity. Watch for more ideas to use with learners to increase their understanding of thoughts that provides the foundation for further perspective taking skill development.